There are three types of big boat racing sailors on the Bay: those who have not yet tried overnight racing; those who have done it once and checked it off their bucket lists; and those who have tried it and gotten addicted. The been-there, got-the-T-shirt types remember a cold, stormy, windless night or a sleepless, slow, thankless night or a combination of such. Sailors who compete regularly in such races overlook the discomfort and relish in the challenge. Solomons sailor John Edwards, who used to sail his Farr 30 Rhumb Punch in a couple of overnight Bay races per year says, “The darkness and uncertainty of your surroundings add to the sailing experience… and keep me awake all night. A part of it is fear, but the lure is mostly the challenge. By 3 or 4 a.m., I would pay to know where the other guys in my class are on the course. But, I don’t know, and every stern light has to be passed. If you have some percentage of that passion and are not willing to accept that you are going fast enough, then the benefit of racing at night is greater than the discomfort of dampness and the fear of thunderstorms. St. Mary’s College of Maryland’s signature overnight race, the Governor’s Cup Yacht Race, starts off Annapolis in the afternoon of Friday, August 3 and runs 70 nautical miles south to St. Mary’s City. As well as the Annapolis start, there will also be starts off the Potomac and off Fishing Bay; all competing boats finish in St. Mary’s City. St. Mary’s College head sailing coach Adam Werblow will emcee the post-race awards ceremony with SpinSheet’s editor Molly Winans. To learn more about the event, visit smcm.edu/govcup. All boats that compete in distance races need to deliver the boat to the start line or deliver it home after the race. 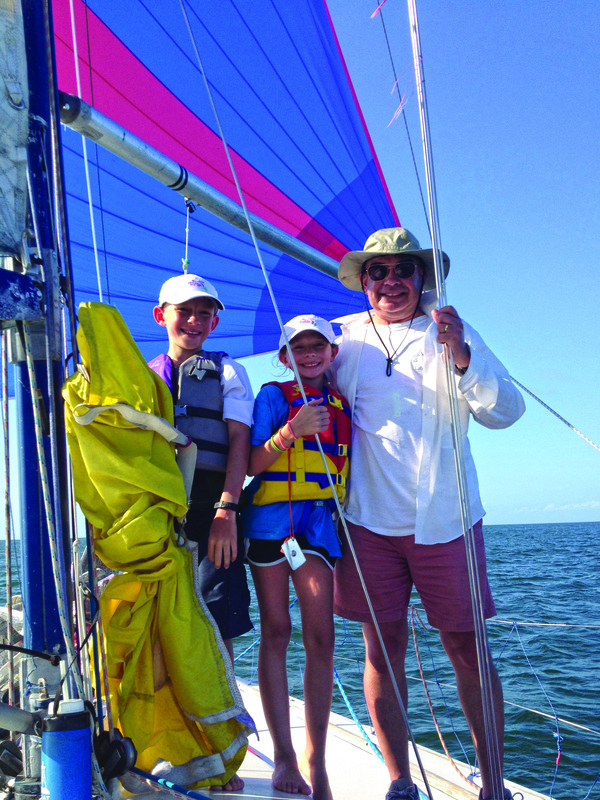 Here’s what Kip Louttit, navigator on the Annapolis-based Beneteau One Ton Air Mail, has to say about the 120-nautical-mile delivery home to Annapolis after a 120-mile Down the Bay Race to Hampton, VA on one Memorial Day Weekend. The delivery crew from Hampton home to Annapolis. « Don’t Forget to Rest!